Published on Saturday, November 5, 2011. In just under 10 years, Stefan Friedemann and Laura Lapachin have earned a far-reaching reputation witih their Hudson-based gallery Ornamentum, specializing in contemporary art jewelry. Founded in 2002, Ornamentum became in 2008 the first jewelry gallery accepted into Design Miami. This past summer, the couple took the illustrious gallery on the road – and overseas – to participate on Design Miami/Basel. As the couple prepared for an exciting SOFA Chicago weekend (booth 520), Stefan took time to tell us more about the artists they represent and their gallery's multifaceted appeal. You're known for the top-notch artists you represent, but also your savvy in how you present their work. Could you begin by telling us about the three artists you're bringing to SOFA Chicago? 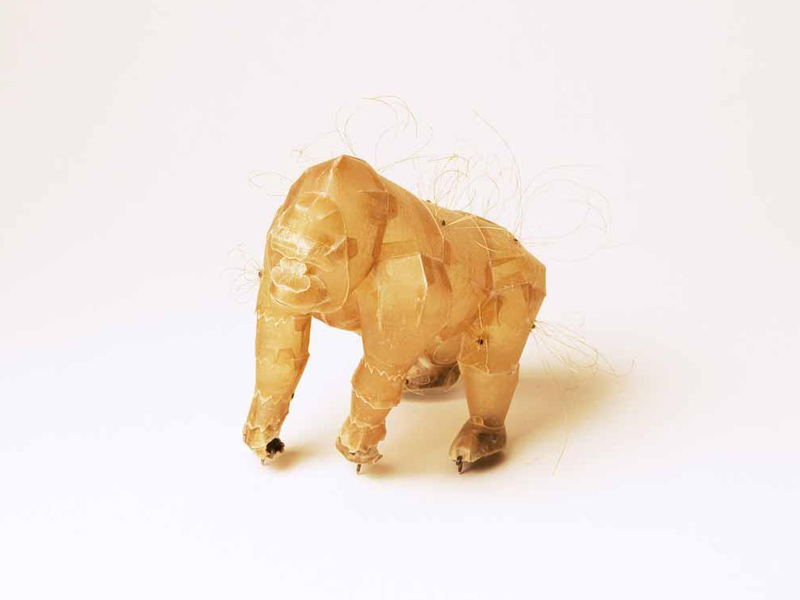 Eunmi Chun is Korean, recently graduated from the Academy of Fine Arts, Munich Germany; she makes animal figures out of dried intestinal skin and human hair (sometimes gold-leafed), oddly (and somewhat macabre) beautiful forms sewn together to give a slightly cubistic feeling to the golden, transluscent representational forms. The scale is quite large for a wearable piece making them all the more striking, both as an object and as jewelry. In 2008, while still a student, Eunmi was awarded the very prestigious Herbert Hofmann Prize in Munich. Caroline Gore teaches at Western Michigan University and makes sensuous pieces (primarily brooches and necklaces) in black. Materials such as leather, silver, glass, beads, and carved jet flirt with the wearer's body - dark but absolutely feminine. Juxtaposition of scale and traditionally recogized techniques of beading are used to surprising and pleasing effect, as unexpected loops and swirls break the obvious patterns that one associates with such works - whose forms hint, at first glance, to references of Victorian and Gothic, but actually meander on a contemporary and much less traveled path. Laura Prieto-Valesco teaches in Chicago at the School of the Art Institute of Chicago and is one of the SNAG emerging artist speakers. This is Laura's debut with Ornamentum and at SOFA. 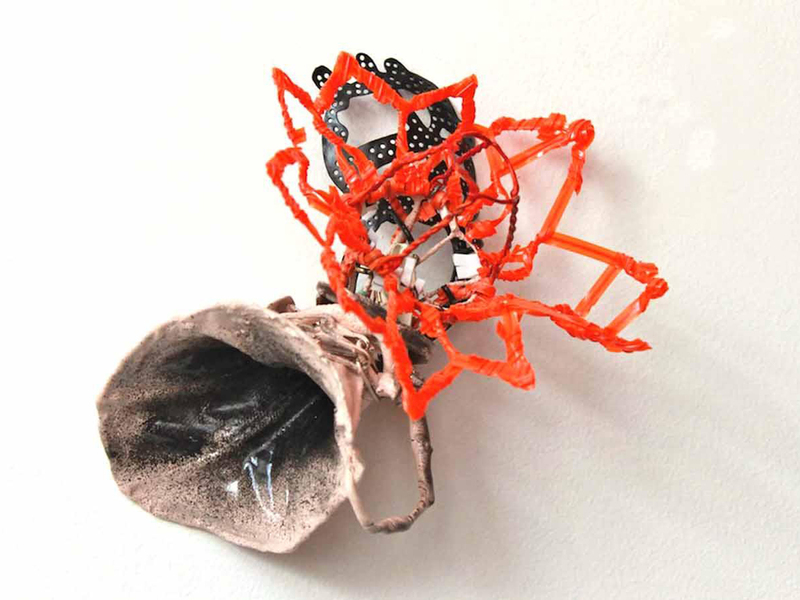 She makes an intriguing body of work out of materials like leather, twist-ties, metal, powder-coat... dark lines tangle with blasts of bright red. The forms may hint at floral or anatomical reference, but movement of flamenco dance is the underlying theme - in particular, the essence of "duende, the conversation between dark and light, beauty and ugliness, elegance and disarray." How do you approach representing three aesthetics in your booth? It is important that each artist be given a distinctly separate space so that the work is not overpowered by the others. With SOFA chicago happening right before Design Miami, we opted not to have a larger than normal booth, but I think that the clear plan of our booth design will give each of these talents a great platform for exhibition. I'm a visitor at SOFA, and I stop at Ornamentum: Which few works I should absolutely not miss? Cancel your plans for the short term future and settle in to stay a while. In all seriousness, we are especially excited about the three exhibitions, as well as the sampling of gallery inventory that will also be on hand, although some of those works may be familiar to some of our best clients. We have a strong show planned; we love and stand behind all the work that we represent - it is difficult to single out a particular piece or pieces. This past summer you were the first (and only) contemporary jewelry gallery to exhibit as a main-floor exhibiting gallery at Design Miami/Basel. Tell us about your experience there. In 2008 we were the first jewelry gallery at all to be accepted into the Design Miami fair in any context. We have worked hard to hold that distinction, keep our place there, and build momentum at this prestigious venue - bringing the medium of contemporary jewelry to a new audience of high-end design and of course the Art Basel fine arts crowd. I think that this was the real ground-breaking move; our decision to exhibit in Basel was simply a continuation of what we started, which was greeted with great enthusiasm by a very sophisticated crowd. It was a very exciting move. Ornamentum is successful across many fields - design and craft, for example, fashion and art. Is this a strength for the gallery? Where are your strongest ties? Our strongest ties are still with the known collecting base of "art jewelry." I think that our background as designers/artists out of European schooling has given us a perspective that (often at odds with the typical USA mentality) isn't afraid to see the parallels and connections in form/concept development between the field of contemporary jewelry and the design world, which in my opinion has a huge connection both visually and conceptually with much of what is going on in the fine arts world. I believe that this shows in our overall approach to jewelry - curation and presentation and is leading us to be taken seriously by collectors and connoisseurs of those other fields. Right now, many people are working to move forward in what many experts agree is a changed economy. As the owner of a retail gallery, how have you adapted? We just keep on going, what else can we do? Buckle down on expenses that may not be necessary, try to balance an aversion for risk with the need for doing exciting things so that the gallery stays ahead but doesn't go underwater. I am lucky to be somewhat handy, so I often build displays, renovate or make changes to the gallery myself - making the workload that much larger but keeping expenses minimal. Booth design, postcards, and advertisements are also designed ourselves. From a gallery owner's perspective, what qualities does your ideal artist possess? Besides having consistently challenging and strong work, manufactured with an eye towards quality, the traits our ideal artist possesses are: trust, open and honest communication, trust... Our ideal artist works with us as a team. Of course each situation is different, but the more we can do for each other, the more we grant each other - be it strong work, exclusivity, exhibitions.... the more that both can benefit. It is important that the gallery makes great efforts on behalf of promoting and hopefully selling an artist. Equally important is that the artist realizes what is being done on their behalf and respects the amount of time and investment that goes into them (and promoting the gallery in general which comes back to helping them out as well - investments that may not be directly linked to a particular artist in the short term can help the artist in the long term). Understanding that it may take time to build momentum is also important. Finally, it's no secret that running a gallery - especially an excellent gallery - is a lot of work. What's the reward? What do you love about Ornamentum? It is a tremendous amount of work, especially dealing with a medium that is still a niche and not a huge money-maker, making the prospect of employees to lighten the workload less possible. On the other hand, this is the medium we studied, love, and have dedicated already half of our lives to in one way or another, so we are surrounded by the work we love and we get to share our passion with an ever-expanding list of appreciators. In Chicago this weekend? Visit Ornamentum in booth 520 at the Navy Pier Festival Hall. SOFA Chicago runs throguh Sunday, November 6. 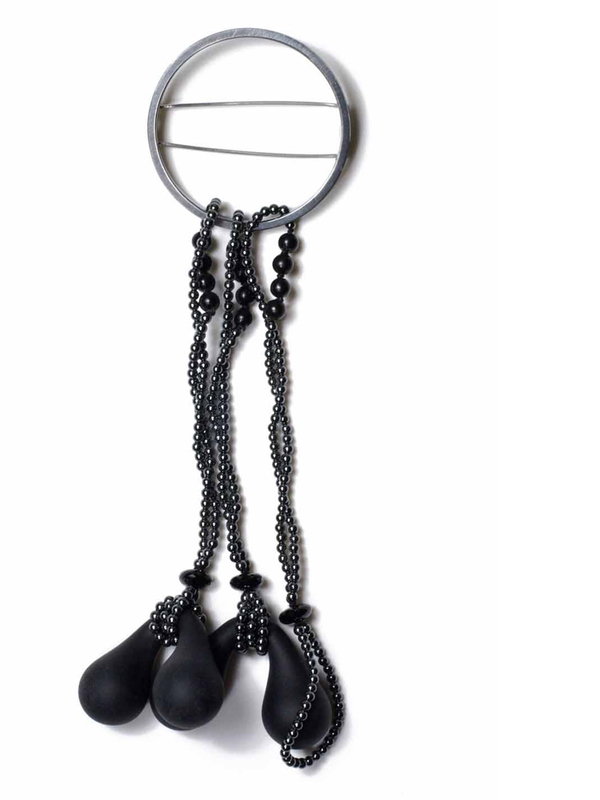 Caroline Gore, Harnessing Brooch, 2011, oxidized silver, jet, black spinel, hematite, borosilicate glass, silk, 5.75 x 2 x .5 in. 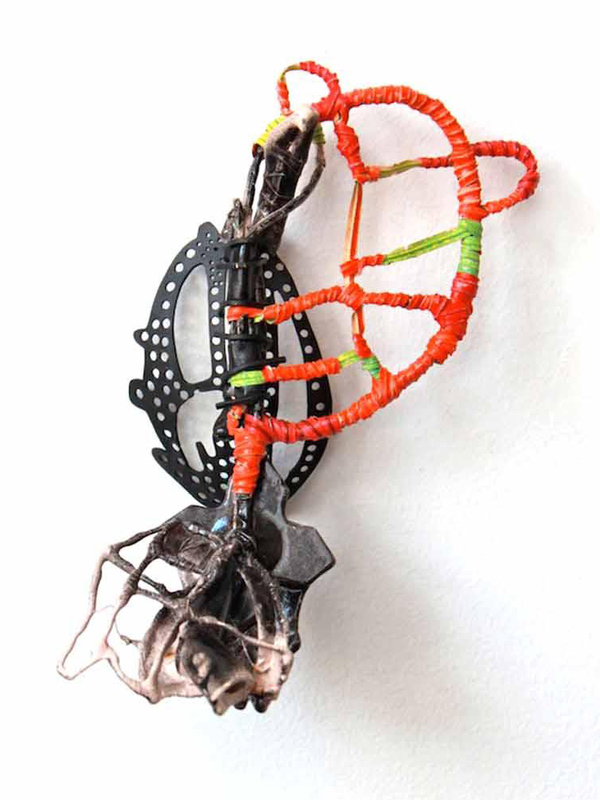 Laura Prieto-Velasco, Fly Brooch, 2011, iron wire, latex paint, tape, twist ties, brass with powder coat, 6 x 3 x 5 in. 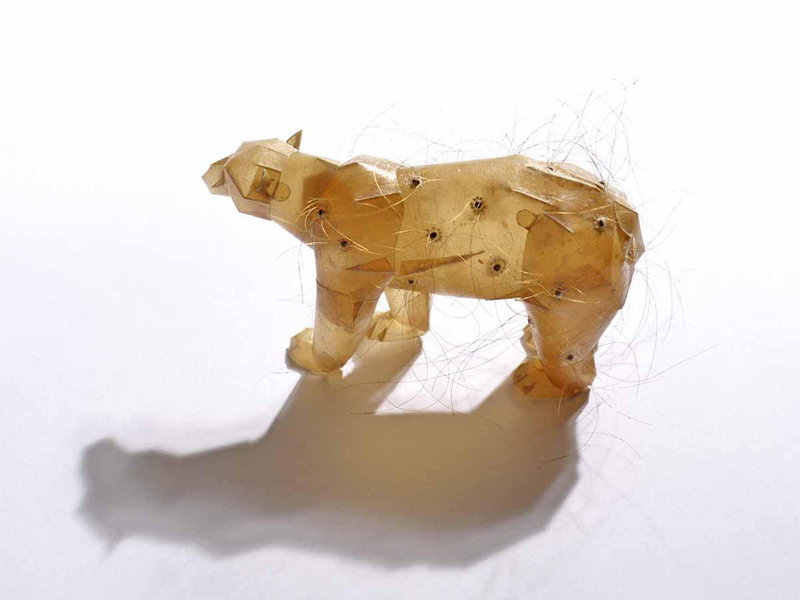 Laura Prieto-Velasco, The Predator Brooch, 2011, iron wire, latex paint, vintage chain, twist ties, brass with powder coat, 6 x 3.5 x 2.5 in.